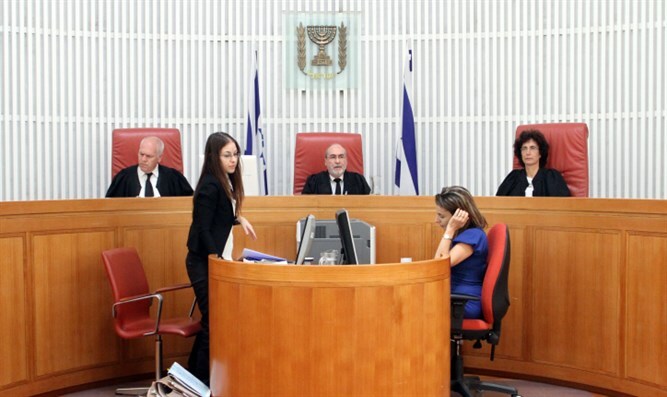 Proposed law aims to cancel Supreme Court's 'right' to cancel laws enacted by Knesset, suggests Israel adopt UK-like model. MK Moti Yogev (Jewish Home) will submit a bill this week to remove the Israeli Supreme Court's unlimited control of Israel's laws and justice system. The bill was suggested by the "Derech Chaim Movement," which aims to infuse Jewish values into Israel's government and legal system. The new proposal would end the Supreme Court's ability to cancel laws of which they do not approve. In a 30-page booklet, the organization explained the history of Israel's Supreme Court, and how previous justices progressively influenced the system until the court achieved the ability to intervene in the Knesset's lawmaking abilities as it does today. The booklet suggests adopting a model similar to England's, in which the Supreme Court can point out contradictions between basic laws and new laws, but the only ones with the authority to cancel or create laws are members of the government itself. Israel does not have a basic law authorizing the Supreme Court to cancel new laws nor does it have a "checks and balances" system as does the United States. However, the Supreme Court has decided it has this authority because of how its justices interpret the basic law on "human dignity and liberty," although when this same basic law was passed, the lawmakers stated explicitly that it was "not intended to authorize the Supreme Court to cancel laws." Similar laws to that being proposed were suggested twice in December 2006, but were not actually passed. Supporting the proposal are Coalition Chairman David Bitan (Likud) and MKs Yehuda Glick (Likud) and Yisrael Eichler (UTJ). Other MKs are expected to sign the proposal in the coming week. A Derech Chaim spokesman said, "Over and over we see the difficulty Israel's Supreme Court poses to the public's elected government when it attempts to lead the country it was chosen to lead. Residents of south Tel Aviv, settlers in Judea and Samaria, the haredi community - all of these are harmed by the Supreme Court's dictatorsial powers." "The time has come for the Knesset to work to restore its authority, taken from it by the Supreme Court. The Knesset must stop the situation in which the unelected Supreme Court justices, whose worldview represents a tiny fraction of the Israeli public, dictate to all of us what is right and what is not, what is ethical and what is corrupt." Attorney Uri Tzipori, who works with Derech Chaim, said, "I think this is an important and necessary proposal. The Supreme Court stole the reins of government in 1995. There is no precedent in the world for a situation which allows the Supreme Court to declare itself above the law and criticize laws the government passes without actually receiving the authority to do so and without laws supporting such actions." "If the Supreme Court has understood the Knesset's silence to signal agreement to their policy, this new proposal will show them that the entire nation and its representatives do not agree to it." MK Moti Yogev said, "This law will remove the Supreme Court's ability to cancel laws made by the publicly chosen government. It will return Israel's democracy." "This is what we had from the time Israel was founded until 20 years ago. This is what other democratic countries do, and this is what Israel should do - for the sake of Judaism and for the sake of democracy." Twenty years ago, Supreme Court Justice Aharon Barak, who expressed the opinion that the "enlightened community" must set judicial norms, declared that "everything is justiciable" and instituted a radical policy of unprecedented judicial activism that caused Richard Posner of the New Republic to accuse Barak of acting as "a legal buccaneer," and describe his approach as "usurpative." Posner crowned Barak, in the very title of his review, as no less than an "Enlightened Despot."